Activities, materials and equipment encourage children of varying abilities to develop their large muscles. 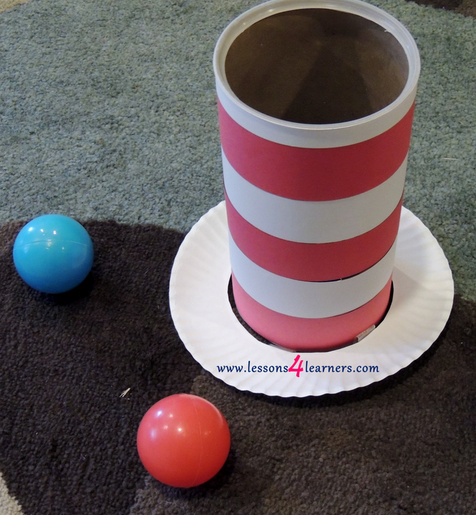 Prepare for the activity by creating the hat that students will throw at. Cut out the middle portion of the paper plate so that it fits over the oatmeal container and secure with tape. Wrap and tape white paper around the container. Cut the red paper into thick strips and tape onto the hat. Show the students how to underhand throw the balls. Encourage students to practice throwing. Counting skills can be practiced at this time as well. Theodor Seuss Geisel was born on March 2, 1904, in Springfield, Massachusetts. After attending Dartmouth College and Oxford University, he began a career as an illustrator and writer. His work was featured in magazines such as LIFE and Vanity Fair. The first children’s book that Geisel wrote was And to Think That I Saw It on Mulberry Street in 1937. However, the book was rejected 27 times before it was finally published by Vanguard Press. A major turning point came in Geisel’s life when he was challenged by the publishers Houghton Mifflin and Random House to create a book using only 225 basic words. The result was The Cat in the Hat,which cemented his place in children’s literature. Theodor Seuss Geisel passed away from oral cancer on September 24, 1991 in his home in California at the age of 87. Dr. Seuss remains one of the best-selling authors of all time. His books have been translated into twenty languages as well as Braille.